3) Texas A&M - The Aggies were down 10 at their own 1 with less than 8 minutes left to play. But they were able to overcome 6 turnovers to beat Ole Miss in Oxford (who could finish 4th in the West this year). Elsewhere, former A&M FBS opponents were 3-0, including wins over LSU and Auburn. Then, losses by #15, #21, #23, #24 and #25 opened up a spot for the Aggies in the AP top 25. 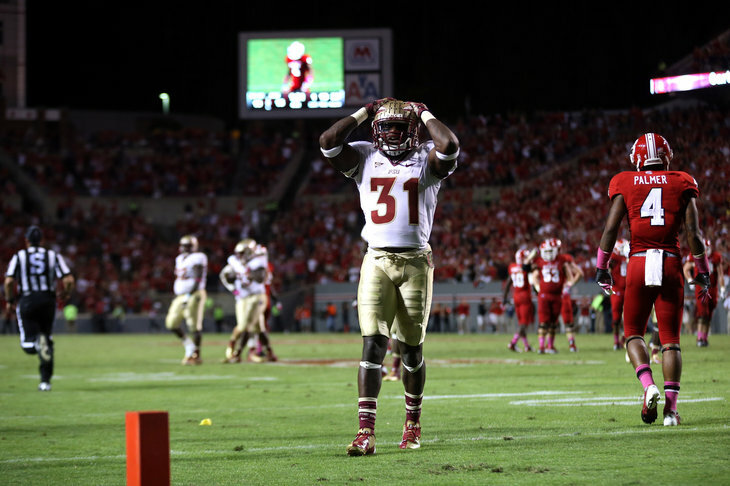 1) The ACC - Florida State is effectively out of national title contention. The team they lost to was the same team that made people think Miami had a good offense. Notre Dame proved that was not the case. Miami, Virginia Tech, and Georgia Tech are not in a good place, and that is bad for the ACC. And Boston College lost to Army. Army lost by 20 to Stony Brook. Army is terrible (at football). 2) Georgia (LSU honorable mention) - LSU can still play its way into contention, but Georgia needs more than a little help to be a real national title contender again. More critical, Georgia just wasn't good enough to matter. The defense continues to be underwhelming, and now the offense proved fallible. 3) UCLA - After a hot start, UCLA has lost two of the last three. Oregon State is solid, and Cal is better than the record suggests. But UCLA didn't just lose; they lost by 26. Cal isn't that good. TCU and West Virginia wanted to demonstrate that they really belong in the Big 12. West Virginia won two straight games while allowing well over 100 total points. TCU dropped their top 15 ranking by losing to Iowa State. Welcome to the Big 12. Missouri, on the other hand, could be at risk of losing its SEC card after losing to Vanderbilt. The BYU defense has kept offenses out of the end zone in four of six games this season. The defense has allowed only 4 TDs all season while the offense has allowed another two. BYU could be undefeated if it weren't for missed field goals, missed extra points, and turnovers. They aren't undefeated because missed field goals, missed extra points, and turnovers still count. Tulane Watch 2012: Carlos Santos led the Green Wave to a new team season high with 13 points. Santos connected twice from over 40 yards. Ponder completed only 14 of 39 passes, but Tulane managed 53 rushing yards on only 22 attempts. Louisiana Lafayette ultimately proved too much for Tulane, but 2.4 yards per carry gives them something to build on.